H is for Hawk is hard to categorize. It is part-memoir and part-biography. The author, Helen Macdonald, is a naturalist and professional hawker, who, after the death of her father, decided to train a notoriously unruly bird of prey: a goshawk. But her personal story is punctuated by passages from the fictions and memoirs of T.H. White. The author of The Once and Future King also attempted to train a goshawk. As a child, Helen Macdonald was obsessed with birds of prey. She read 17th-century books on falconry and was conversant with the specialized vocabulary of the trade. Her father Alisdair, a British photojournalist for the Daily Mirror, taught her to consider the world from different angles and from different heights. Thus, Macdonald attributes her passion for falconry to her father. Unlike Macdonald, T.H. White was not a professional austringer. There seems to have been a number of psychological reasons for his fascination with birds of prey. White was a homosexual, with sadistic tendencies. Macdonald references White’s story throughout her memoir because she feels a certain affinity to the early 20th-century author. She too struggles with guilt, loneliness, and depression. Macdonald is a brilliant prose-writer. Although I don’t usually grab for memoirs, I was hooked from page one. In one of my favorite passages in the book, Macdonald attempts to understand why early modern austringers insisted on describing goshawks as fractious and emotional. Sure, Mabel the goshawk has her days, but Macdonald is surprised by the words goshawk experts have used throughout history to describe a bird of prey. “Capricious”, “emotional”, and “spiteful” are adjectives that have also been used to describe women. 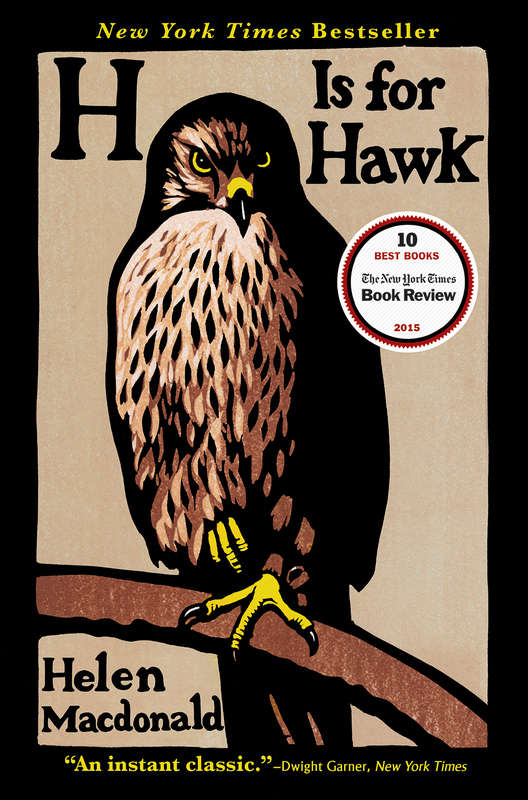 H is for Hawk is noteworthy for its humanistic approach to nature writing. Nevertheless, Macdonald makes assumptions about White’s personality that didn’t always sit well with me. Although White struggled with his sexuality, I am wary of Freudian interpretations of a person’s life. I suspect that White fought with his goshawk Gus not only because he had an impatient personality but also because he was not a professional falconer; he did not have experience training other birds of prey. Finally, Macdonald’s analysis of T.H. White felt a bit unfair. A memoir is a very intimate genre. The author is the most frank with her reader. I wish that Macdonald had stuck to telling her own story, because White already told his in his own memoirs. Despite my frustration with the passages on T.H. White, I know many readers who loved Mcdonald’s take on the author of the Once and Future King. I am certainly glad that I read H is for Hawk because the writing was beautiful and the descriptions of depression were on-point. Macdonald has also inspired me to read T.H. White’s The Goshawk in the near future. I consider that a successful book.